(below) Director Dr. Lori Baptista talks to guests about their experiences with apartheid on Thursday December 12, 2013 at the Nelson Mandela Memorial service hosted at the AACC. 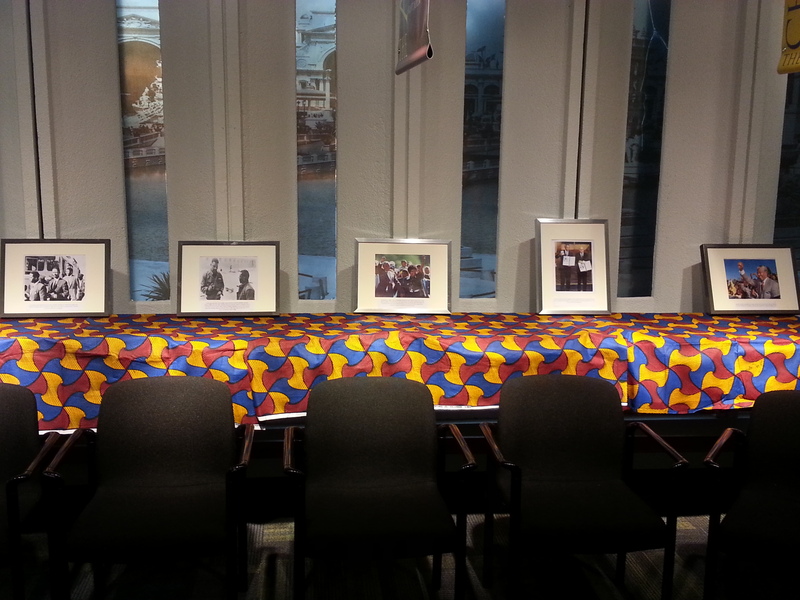 Visitors took turns telling stories, thoughts and memories about the life of Nelson Mandela. Some visitors read aloud from excerpts from Mandela’s speeches. The conversations centered around what a legacy is and thinking about ways to keep the work of Mandela alive as we move forward. The peace sign surrounding the pan-African flag reminds us of Mandela’s mission to eliminate hatred and segregation in South Africa and throughout the world. Visitors were able to leave a thought or note on a post-it in the peace sign as we reflected on ways to continue Mandela’s legacy. 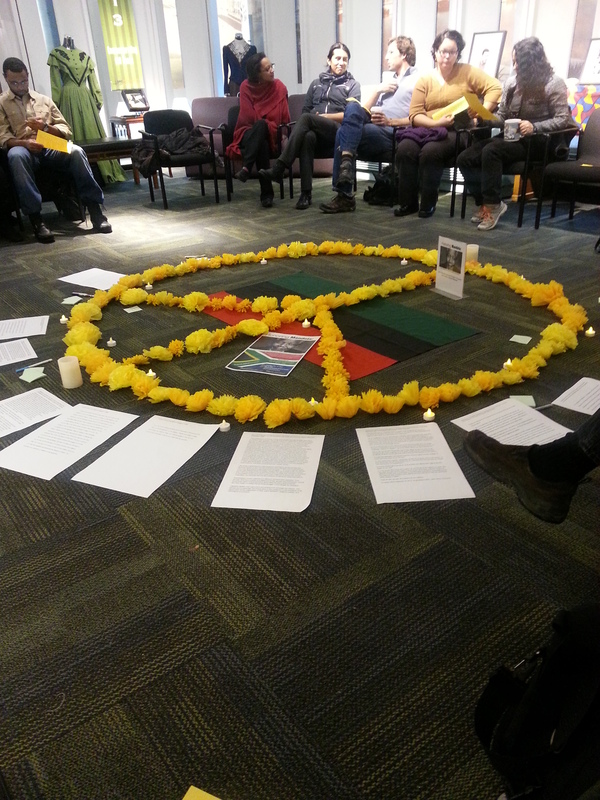 The flowers that formed the peace sign were from the Latino Cultural Center’s Day of the Day celebration. It stood also a reminder to celebrate the life and legacy of Mandela as well a signifier of uniting people from all backgrounds. We included a visual timeline of Mandela’s life to aid us in our reflections. 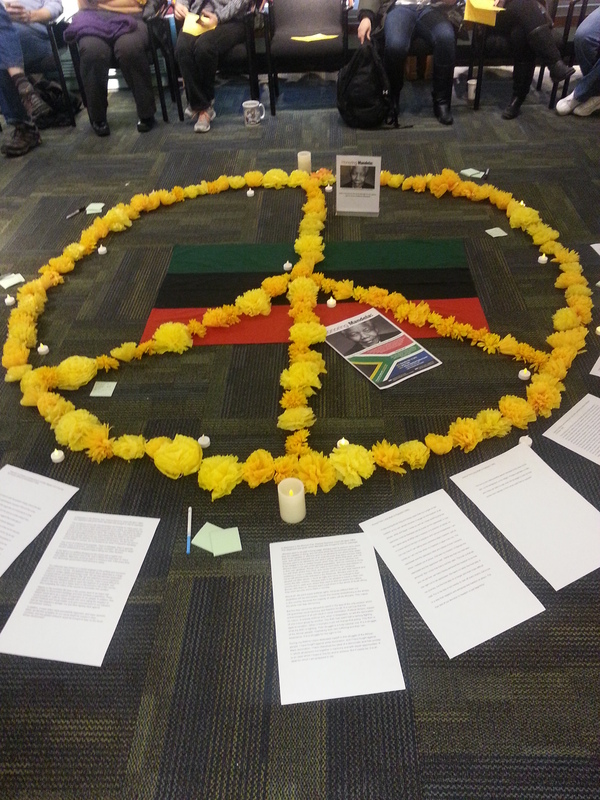 Many expressed how much courage it took Mandela to move forward and the challenges he faced throughout his life. We reflected on ways to work together as a community and talked about the power of an individual working for change. There was a diverse range of different perspectives, age groups, and backgrounds which made this event feel extremely special. It was an excellent space for people to encourage the continuity of social change and the need to work toward social justice. ← Victorian-Era Costume Party, December 6, 201!